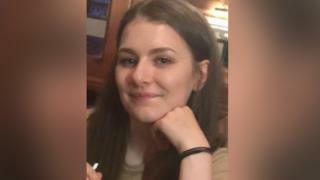 Student Libby Squire has been remembered at a special church service where hundreds of flowers were preserved in her memory. The 21-year-old's body was found in the Humber Estuary last Wednesday after going missing in Hull on 31 January. Ms Squire was last seen on a bench on Beverley Road, where flowers and messages have since been left. The flowers have been turned into potpourri after her family asked they did not go to waste. Hull Community Church has collected more than 400 bunches of flowers from the bench area. Minister Anne Dannerolle said they had been in contact with Ms Squire's parents, from High Wycombe, Buckinghamshire, who had asked that the flowers not be left to fade. Ms Dannerolle said the potpourri was given to 160 people who attended the service, as well as Ms Squire's family and friends, and that anything left over would be handed out in the community. "The response has been phenomenal. There has been this mass outpouring of love for Libby which has been wonderful to see," she said. The church is now working with the family for a more permanent memorial to the student. Humberside Police have said Ms Squire's death is being treated as a homicide investigation.